First lady Michelle Obama speaks to students about higher education at a Washington, D.C. high school in November 2013. Mrs. Obama travels to China this week on a “people-to-people exchange” to emphasize the importance of education to both nations. 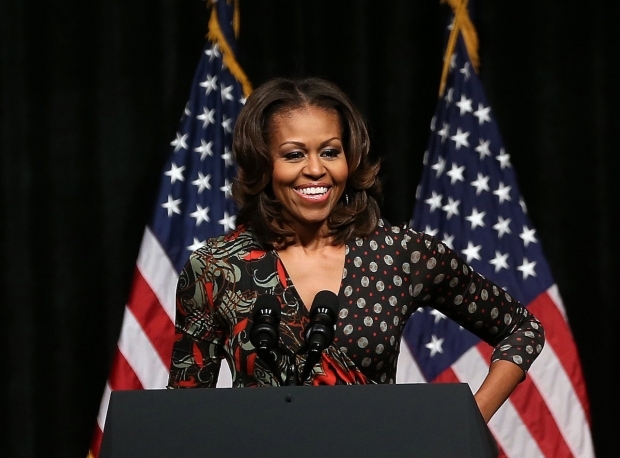 What Should Michelle Obama Accomplish on Her Trip to China? Jindong Cai is a Professor of Orchestral Studies at Stanford University. He is co-author, with Sheila Melvin, of Rhapsody in Red: How Western Classical Music Became Chinese. Orville Schell: Looking at the challenges of rectifying U.S.-China relations and building some semblance of the "new kind of a big power relationship" alluded to by presidents Obama and Xi at Sunnylands last year, will most certainly require a multi-stage ongoing effort. Michelle Obama's trip to China with her mother and her two daughters this week could prove to be a very constructive next step. Because her trip offers a symbolic expression of a genuine commitment on the part of the U.S. to doing everything it can to achieve a breakthrough in relations with China, the First Lady's visit could end up being a very sage prelude to the next official meeting between the American and Chinese presidents in the Hague on March 24-25. Indeed, confronting all the problems that divide our two countries —maritime/island disputes, cyber-warfare, human rights, the Ukraine, nuclear proliferation, etc.—will pose an infinitely arduous challenge to Presidents Obama and Xi, but they are inescapably the responsibility of the two presidents, not the First Ladies. So, while these many difficult issues will remain unaddressed by Michelle Obama and Chinese First Lady Peng Liyuan, what makes this visit to China a smart move by the White House is that it will enable the U.S. to demonstrate in the most obviously friendly way the importance it attaches to our future bilateral relationship with the P.R.C. It will allow a highly symbolic interaction between the countries without the two countries needing to get into the host of contentious issues which divide us and which have no easy answers. But, we should be realistic. Michelle Obama's trip is only a gesture, albeit an important one. For our two presidents to actually hit the proverbial "reset" button, they will have to evince some real leadership, innovative thinking, even risk taking. Such leadership has not yet been fully manifested. If they fail, the world will then also fail in resolving a range of critical and antagonistic global problems— including nuclear proliferation, climate change, cyber-hacking, pandemics, and other challenges that can only be met through real bilateral cooperation. If the idea of establishing "a new kind of big power relations" is ever to be made more than an empty slogan, it will be necessary for both sides to become far bolder in their approaches to each other. Having dispatched his family to China on what could be described literally as a “panda-hugging” expedition, President Obama might—if only he will take up the invitation— be firmer in his representations with President Xi when he meets him later at the Hague. Both sides yearn for the kind breakthrough in the interaction between the U.S. and China that has eluded us since the 1972 Nixon/Kissinger-Mao/Zhou breakthrough, and then the Jimmy Carter-Deng Xiaoping recognition breakthrough in 1979. We yearn for such moments redux because they were the occasions when our leaders actually did reach for the stars and did last succeed in recasting our bilateral relations. To again accomplish such a breakthrough moment, both Obama and Xi are going to have to wade not only into the host of difficult issues which divide us, but also to find new ways to set aside some of the historical suspiciousness with which leaders of our two countries have approached each other lately. That is a far taller order, and not one that a Michelle Obama visit will accomplish. But then her trip does not aspire to such a grand accomplishment. Her visit could serve as an important next step in the far longer process of establishing "a new form of big power relations," and a smart way to move the relationship forward by expressing the United States’ commitment to “working things out.” But, it will be no a substitute for the kind heavy lifting that will come next. Michelle Obama’s visit to China will no doubt draw much attention. The two nations are developing a new type of “big power relationship,” and the meeting of the two first ladies could give an extra dimension to this yet-to-be-defined concept. Journalists may describe this as “first lady diplomacy” between China and the U.S. If it emerges as an important theme then Michelle Obama and Peng Liyuan will no doubt be remembered for this in the future. Chinese first ladies have always been unassuming and inactive in the past; they lived in the shadow of their powerful husbands, and usually shied away from the media spotlight. Yet Peng Liyuan, herself a celebrity before Xi Jinping’s presidency, has proved to be an exception. In the U.S., first ladies are completely the opposite: Hillary Clinton had her own office in the West Wing, and Michelle Obama was arguably an important figure behind the nation’s historic medicare insurance plan. They are a part of American political life. Aside from showing off their stylish dresses, I hope the two first ladies will make some kind of announcement to boost mutual understanding and exchange. This is perhaps the most important thing today, amid the escalation of a zero-sum mentality between China and the United States. The White House says politics will not be on the itinerary of Michelle Obama’s tour of China. She will give no interviews and no reporters will be traveling with her. This is a shame, especially since the First Lady’s visit comes just one week after a prominent, female rights activist, Cao Shunli, died in custody because Chinese authorities denied her lawyers’ requests to have her released on medical parole, according to rights groups. Cao had pressured Beijing to include the input of Chinese civil society in the Chinese government’s report to the U.N. Human Rights Council, but she was detained at Beijing’s international airport in September while attempting to leave for a training program in Geneva. Contrast Michelle Obama’s avoidance of the media in China with former First Lady Hillary Clinton’s powerful speech at the 1995 UN World Conference on Women in Beijing, where she declared that “human rights are women’s rights and women's rights are human rights.” Next year marks the twentieth anniversary of the UN Conference on Women, so Michelle Obama -- travelling with her mother and two daughters – has a natural opportunity to highlight women’s rights during her trip. In recent years, contrary to many claims made in the media, women in China have experienced a dramatic rollback of rights and gains relative to men. The gender wealth gap is widening sharply, female labor force participation in the cities is dropping, women’s property rights have been dealt a severe blow with the 2011 re-interpretation of China’s Marriage Law, and the proportion of women in the Party’s Central Committee has fallen to a dismal 4.9 percent. Even if the First Lady refuses to take questions from reporters, she should meet with members of women’s NGOs and feminist groups, which have lobbied the government for over a decade to pass targeted legislation against the epidemic of intimate partner violence in China. Government figures state that one-quarter of China’s women have experienced domestic violence, but feminist activists say the figure is vastly understated. Ms. Obama should also meet with American Kim Lee, a mother of three daughters who has gone public about violent abuse at the hands of her ex-husband, Li Yang, the multi-millionaire founder of “Crazy English” (a famous way of learning English through overcoming inhibitions). In spite of all the maneuvering to keep politics off Michelle Obama’s China itinerary, I agree with Orville Schell and Vincent Ni that the First Lady’s trip could potentially be constructive. Ms. Obama is hugely popular in China, and she could demonstrate that “people-to-people exchanges” must include meaningful dialogue about how to improve the status of nearly one fifth of the world’s women. Orville and Vincent have almost persuaded me that U.S.-China relations will best be served if First Lady Michelle Obama’s trip to China is little more than a public diplomacy tour de force. Indeed, she is already off to a good start. Chinese press commentary surrounding Mrs. Obama’s visit has been glowing. Yet I can’t help but feel that an opportunity is being sacrificed on the altar of wishful thinking. The opportunity is to use the umbrella of education and culture—the focus of the first lady’s trip—to engage issues such as restrictions on American films, journalists, and educational institutions in China. These are important issues and the first lady has a unique opening to raise them with the first lady of China, Peng Liyuan, herself a singing sensation and embodiment of Chinese culture. The altar of wishful thinking is that this trip will in some way influence how Chinese president Xi Jinping directs the Chinese navy to behave on the East and South China Seas or how he responds to Russia’s behavior in Crimea. Even beyond the issue of a missed opportunity, I am puzzled at the first lady’s apparent decision not to travel or have interviews with journalists during her trip. Certainly she is making herself extraordinarily accessible via social media, and granted, according to the State Department, public diplomacy means “government-sponsored programs intended to inform or influence public opinion in other countries”—not informing or influencing people at home. However, refusing to address the press directly sends the wrong message not only to people in the United States but also to Chinese citizens, and most critically, doesn’t reflect the first lady’s one policy-related promise: to share American values and traditions. Forgive me for my bluntness, but Mrs. Obama and her family are the best the U.S. has to present to the world. They are, first and foremost, dignified, even reserved in their public personae. Throughout their public lives, they have embodied "family values" in a far more powerful sense than that term has come to imply through the dreary years of its political abasement. Whether or not Mrs. Obama, her mother, and her daughters are accompanied throughout their trip by legions of diplomatic staffers (and they will be), I am certain that they will convey directly to Mme. Peng Liyuan and to the Chinese people a sincere message of mutual respect, shared humanity, sober awareness of unfinished societal tasks and global responsibilities, and genuine celebration of their loved ones, starting with Presidents Xi and Obama. Hopefully, that message will be accurately conveyed—and accurately rendered into Chinese—by China's media. Mrs. Obama speaks naturally with clear, organized syntax, so I'm optimistic on this front, but it behooves the key interpreters on both sides to work together intensely and (if necessary) instantaneously on language issues throughout the trip. I have never met Mrs. Obama or her family, but having watched them for some years, now, I believe that they will prove on this trip to be avid listeners, avid observers, and avid learners. I am certain that, without bombast or a barrage of clichés, the First Lady in particular will contribute to a more full-bodied Chinese understanding of our nation and our people. We learn that the trip will avoid "politics." Well and good: no long tables lined with opposing delegations, no lengthy recitations of talking points, no wrangling over islets or the denuclearization of this or that hotspot, no bluster about currency manipulation, etc., etc. Let's let the Obamas be visitors to a land they hardly know, and welcome what will surely be a warm and unusually personal kind of hospitality from Mme. Peng and her associates. Nevertheless, "All mothers love their children," unfortunately cannot be the sum total of Major Power Relations in its vaunted New Framework. Celebrations of common humanity can be vitally important, but their half-life, in the real world, can be very short. For that reason, though the Obamas will surely not be spending much time on Crimea or military-military engagement, it would be very nice if they and their hosts could, by the end of the trip, find common ground for future cooperation in a few meaningful areas of shared concern. One doesn't know; I certainly have not been planning the visit. Perhaps nothing "joint" will emerge. But even in the realm of "soft" issues—the arts and literature, early childhood education, family and child welfare, development of non-governmental social cooperative efforts, nutrition, ecological awareness, and so on—we can at least dream of the United States and China taking a few new small steps together, drawn by the compelling image of our two First Families talking the talk, and walking the walk, hand in hand. The U.S. is no longer the charitable donor (and certainly no longer conceives of itself thus), and China is no longer the needy recipient (ditto for China), in this bilateral relationship; those days are now long past. If we're lucky, Mrs. Obama and Mme. Peng will give us a glimpse of the Way Forward for our two countries in our highly touted but still misty New Relationship. But, smog and all, China is simply a mind-bending place to visit, and even if the two First Ladies do not end the tour by agreeing to join hands on specific initiatives, the Obamas are in for an unforgettable experience. I wish them daily enjoyment and plenty of lifelong memories. Let's hope the American people get a "full report" from the First Family when they return. The White House has billed First Lady Michelle Obama’s trip to China, in the company of her mother and daughters, as a “cultural exchange.” This seems to be part of an effort to ratchet down expectations and make it clear that the First Lady will not engage in politics. It is our view, however, that there is already more than enough politics in the U.S.-China relationship and not nearly enough cultural exchange—exchange, of course, being a word that entails reciprocity. Over the past century and more, China has systematically explored, imported, absorbed, and adapted ideas, values, and art forms from the West on a spectacular scale—the primacy of the nation-state, Marxism-Leninism, the symphony orchestra, and so much more. This is not an aberration, but a tradition—four of the five officially recognized religions in China are foreign imports, as are most of the musical instruments we consider “Chinese.” While we in the West now buy countless manufactured goods from China, we have shown comparatively little interest in its ideas, values, or innovations, frequently denigrating them as communist or copycat. That all largely ended with the nineteenth century and for the past 200 years we have absorbed Chinese immigrants—along with their cuisine, and, to a lesser extent, medical philosophy and martial arts—but have rarely reached out in a systematic effort to learn from China so as to improve, enlighten, or augment our own culture, or even simply to better understand the nation that many now see as a rival. The result is a lop-sided “exchange”—Chinese media call it a “cultural deficit”—that is increasingly irksome to China and harmful to our chances of establishing a balanced and productive relationship with an ever stronger, confident, and pro-active PRC. If the magnetic Michelle Obama were to take a genuine interest in China’s culture and help spark a true exchange—meaning one that is sustained well beyond her week of sightseeing—it would do far more to improve our increasingly intertwined political and economic relationship than any cherry-picked discussion of controversial issues. It’s time to resurrect the open-minded optimism of Leibniz and catch fire with fire!